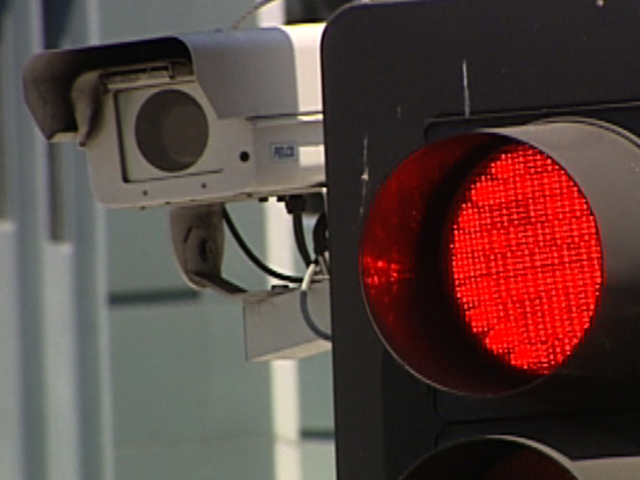 Los Angeles - one of more than 500 cities that have red light cameras - has decided to pull the plug. As CBS News National Correspondent Ben Tracy reported, Los Angeles' system managed to be unpopular and a money-loser at the same time. Los Angeles has 32 red light cameras at various intersections around the city. Since 2004, they have caught 180,000 drivers breaking the law. Yet only about 60 percent of them ever paid the whopping $500 tickets. The city was reportedly losing $1.5 million a year on the program, according to the City of Los Angeles' information. So on Wednesday, the Los Angeles City Council unanimously voted to turn off the red light cameras. Eric Garcetti, president of the Los Angeles City Council, said, "We want safe intersections, but there's not any data that proves this was making these intersections any safer." At least 32 cities nationwide have turned on red light cameras only to switch them back off either because of court orders, collection issues, or data showing they don't improve safety. Jay Beeber, who opposes the red light cameras, told CBS News, "That's what's really important here - that the people of LA will be safer because of the end of this program." Adding to the outrage among Los Angeles drivers is this week's revelation that paying the camera fines has always essentially been voluntary because the city couldn't figure out if they were legally enforceable. Like most folks in Los Angeles, Abigail Stone spends a lot of time in her car. So it was only a matter of time before she got caught by the eye in the sky. "When I started going through it, I swear it was green because I wouldn't have gone through it and all the sudden (it just went) 'boop'" Stone said. Now Stone says she wants her money back. She said, "Why did I pay this ticket? Why was I being such a good citizen throughout the whole thing? Why didn't I just ignore it? Who do I have to call to a refund on this?" The Los Angeles camera program officially ends on Sunday. For more on the legal side of red light cameras, "The Early Show" turned to CBS News Legal Analyst Jack Ford. Ford said some courts in the country have thrown out the tickets because they say it's unconstitutional, such as the highest court in Minnesota. He explained, "The way it works right now, you're looking at a light there. If you get a picture in the mail of a car that has your license plate on it and it says you violated the law, bang, here's the picture, essentially we're saying 'You're guilty,' and some courts have said, 'That's not the way our system works. Our system is such you're innocent until proven guilty.' 'How are they going to prove I was the driver just because the license plate is registered to me?' You've seen some courts who said it doesn't work unless you can prove who the driver is. Ford continued, "Now some states have some cameras that will take a shot of the driver, and in that situation, the courts have said, 'That's fine.' Other states said, 'It's not enough to throw the photograph on the table, and say 'Bang, you're guilty.'' Somebody has to come in and prove this is a legitimate photograph, the camera was working at the time, so there have been a number of issues raised about the legalities, the constitutionality, and some have said, 'We're not happy with this, we're not going to let it stand.'" "Early Show" co-anchor Erica Hill noted laws vary in different cities and municipalities and judges could interpret the laws in different ways. Ford agreed. He said, "Some courts said, 'We're OK with this.' But in some places (like Los Angeles have) said, 'Let's put the constitutionality aside and look at the efficiency, the efficacy of the whole thing and one of the arguments has always been this is going to be a deterrent, to keep people from flying through red lights. But some jurisdictions said we're finding the opposite, it's become a danger, people are so conscious of it, that they'll jam their brakes on beforehand and some have claimed there's a higher incidence of rear end strikes now because people are so concerned about that." So could people fined in Los Angeles get their money back if they paid their red light camera fine? Ford said, "The answer is, 'This is not as if you bought something at the grocery store, this is not what I wanted, give me my money back.' Once you pay your fine you essentially admit your liability, you give up your right to contest it. You have the right to challenge it if you want to, but once you say, 'OK, you know what, here is my check, I'm checking off the guilty part of it. Leave me alone, I can't afford take the day off to come in and contest this,' - whatever your reason is for it - or maybe you were the driver ... Once it's done, it's pretty much done. So even ... if Los Angeles turns around and says, 'Administratively we're not going to do this anymore,' chances are (you're) not getting your money back."